Poor Napoleon has suffered many short jokes. The British nicknamed him "Little Boney." His army buddies gave him the not so flattering title of "Little Corporal." 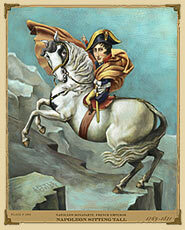 But was Napoleon's short stature just a tall tale? Sign up for the Raucous Royals FREE newsletter!